We know it's cold out there. However we've got a great program to help you warm up and get ready for the upcoming growing season. Today we'll be bringing you ideas for preparing your soil. We'll take a look at a hearty and beautiful shrub. Also we'll help you keep taller plants from flopping over in the winter months. To start our program we're gonna focus on a critter that might look cute, warm and cuddly. However he or she can do a major amount of damage right under the snow. Our wildlife expert Dennis Ferarro tells us that during the winter those voles are looking for homes and something to eat. Your backyard shrubs are the perfect place to eat and stay warm. Here's Dennis to help us save our plants from these pesky little critters. While we're inside, snuggled in with visions of sugarplums in our head, out in our gardens, the voles are ravishing. They're there, and they want to feed on something. And therefore what they go after are tubers if the ground is not frozen. Any seed material that may be on the ground in your garden too. Voles will also go after that nice tender bark around the trees, and these voles can do a lot of damage in the winter. They don't hibernate. So while you're inside going through your catalogue looking for new plants for next season, next spring, the voles are out there eating all the plants that are left and still alive but dormant in your garden. Therefore they can do a lot of damage, so we need to be cognizant if they're out there. So on a nice halfway decent day in the winter, go out in your garden, look around for the vole runs.These runs will even be under the snow cover. Look for their holes. They're active even when it's below zero, but underground. They come up in the day when it gets just above zero. What they'll do is they'll eat any of those tubers, any of those roots of plants that have starches. They'll also girdle your fruit trees. So look around in your fruit trees. Whether they're flowering fruit or whether they're actual edible fruit trees, they will go after all of 'em. Please click here for vole traps on Amazon. And the way to get rid of them, whether it's any time of the year, is to use a multi-catch trap. These work in the winter as well as the summer. You can set these traps along these runs that you find. Preferably on days when it's not below freezing or not snowing. Just put a little burr seed or grass seed around the entrance of the multi-trap. They'll go in there and they'll get trapped. These traps will hold up to 15 or 20 voles. They will get in there overnight, they usually follow each other. The more you get, the lower the population will be causing damage. Now if you catch them several nights in a row you probably get most of the population causing damage in your garden. Now if you feed the birds, be cognizant where that birdseed goes if the birds don't feed on above the ground. If that birdseed is falling, clean up as much as possible. It'll make it so much easier to catch them in your traps. What will happen in the traps is that they'll go in there for a little seed. But if there's seed everywhere, they're less likely to go in the traps. You can also use snap traps such as these. Snap traps with a little molasses, because it's very cold. Remember, made into balls of seed, can catch them at any time. Now put those along the runs. Now once you get 'em trapped, if you leave 'em in the trap overnight they will die of exposure due to the coldness. So remember, be humane when you worry about them. You can translocate them to another location where they're not gonna cause damage. Therefore you need to get them within six hours after you trap them to translocate them. So remember, if you trap 'em and it's cold out you need to check those traps very often. As you just saw, those voles can really tear up an ornamental bed by tunneling under the snow. Chewing up the roots of your plants as their food supply is scarce during the colder months. Setting your traps with a little grain will help you keep them out of your overwintering plant beds. We're proud to offer something new this year in a feature we're calling Go Gardening. We want to help beginning gardeners find their way around in how to get started. As all good gardeners know, good soil makes all the difference in the world. So let's take a few minutes to talk about preparing you soil over the winter, and let's go gardening. People ask us all the time about how to get started in the gardening world. And we're going to tell you, just go garden. Of course it's a little bit more complicated than that. We're going to do a series on Go Garden starting with what our gardeners have done to improve the soil. If you don't have good soil you're not going to have good landscape plants. Whether they're annual, perennial, or trees, it's really simple actually to use a cover crop or a green manure crop if you are vegetable gardening or flower gardening. What our master gardeners have done is chosen a cover crop that they seeded this fall. This is actually a fall green manure crop. It's planted by seed about four to six weeks before the first killing frost. It includes a number of different plants that are in it for different purposes of course. We have spring peas, we have some rye. We have a vetch, and the idea behind this is that we seed it in the fall. The things that are going to actually be killed with the frost will be killed when it frosts or freezes. A couple of them, one of the ryes, the winter rye, and the vetch, will return next spring. What we will then do is the master gardeners will turn this under. They'll wait two to three weeks to plant. The idea behind using a fall green manure crop is this is cool season. Therefore, everything will be out of the way when they want to plant their cool season vegetables in the spring. You can also use warm season green manures like buckwheat that go four to six weeks, start to finish. The idea behind those is of course they will also attract beneficial insects. All of them improve soil health. So what will happen in this particular instance is this green manure that you see will hold the soil over the winter months. It will get tilled in, and then we will plant in the spring. In contrast to the area that our master gardeners have planted to a fall cover crop. this is a space that they actually have turned over. This had our warm season crops in it, the tomatoes, the malabar spinach and some of the peppers. The first thing they did of course is wait until a killing frost or a freeze and all that stuff died. Then they removed the debris. That's really important if you start to go garden. Don't you forget about the fact that a lot of our pathogens and some of our insect pests can overwinter in that debris. So they cleaned that off first, if it was not diseased, they put that in the compost pile. But most importantly what they have done is they have turned the soil by hand in big chunks. They will then stay off that soil over the winter months. What will happen is the freeze/thaw action will break that soil down. They will go ahead and come back in and top dress with ground up leaves and perhaps some compost. That will work its way down into those cracks and crevices. Then in the spring they will either turn again or they will lightly till. The reason that we don't till in the fall is if we have an open winter and you have a very fine texture to the soil, you may in fact do more harm than good. 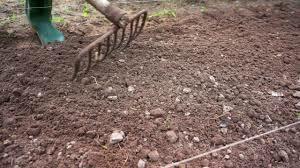 So again, preparing your soil in the fall for your garden is really an excellent idea. If you do almost everything right when you start your garden but you still have poor soil you're going to have very little success. Good soil contains lots of organic matter and it's loose enough to help those roots grow deep and strong. If you're new to gardening and you want the best chance at beautiful ornamentals and a bumper harvest, start by getting that soil prepared and keep at it every growing season. For our landscape lesson this week we're going to take some time to focus on one of our native shrubs. This would be a wonderful addition to a home landscape. Our native Buckbrush is a great choice for partially shaded areas. It can grow just about anywhere including in poor soil conditions. It's great for pollinators and attracting wildlife as well., In the fall it really comes into its own with those wonderful fruits. You've got to love a plant that has multiple uses in the landscape and is also a workhorse. This is our native buckbrush, or coralberry, or Indian currant. Latin name is Symphoricarpos orbiculatus. This is kind of a mouthful, but look at what this plant does in the winter landscape. Symphoricarpos orbiculatus survives all sorts of conditions, and is native. It is one of those go-to plants for a lot of our native bees and pollinators. It forms a colony slowly by suckering and by rooting where those tips touch the ground. Happiest in woodlands, part-shade, full shade, gets a little thinner in full shade. It also tolerates dry conditions, crummy old construction soil which is pretty unusual. It looks like this in the fall and the winter months. It's in the honeysuckle family. The flowers are small in the spring, not very showy. So again, it's not one of those plants you plant for spring interest or great big in-your-face summer bloom. But if you're a pollinating insect, you're gonna love that nectar. For human beings, you have to love the beautiful appearance of the corralberries. This is of course where it gets one of its most common names, and the fact that these can not only persist throughout the winter months but also be a great floral decoration if you want to cut them and take them in for the winter. They are great bird food, and also some small critters and creatures will eat them. But for the most part they're gonna remain on the plant well into the spring of the season. This is an easy shrub to manage. One thing you don't want to do is cut it all the way back to the ground every single season. Because it is in fact a shrub, a woody shrub, not one of those suffrutescent things, not a perennial. So you want to make sure that you allow it to become a thicket. That might make it a bit difficult and tangled to clean out and get rid of all the leaves and those sorts of things. But in an environment where the plant itself can cover up the undergrowth, it looks pretty darn good during the winter months. The coralberries also have been hybridized with other coralberries, with snowberries, but in my book this is the absolute best . There is one called Hancock that is a ground cover form, doesn't fruit, doesn't seem to like the best conditions or the conditions that this one does. So go out and hunt for our native coralberry, put it in your landscape. Enjoy it outside, enjoy it inside. You can hardly go wrong with a shrub that is beloved by pollinators. It feeds and shelters wildlife and can grow just about anyplace. It'll put on a show in both the spring with its teensy flowers and in the fall with that burst of color from all the berries, which actually last through the winter months. Lots of people love growing things to eat out of their own backyard. Who doesn't love spring flowers popping out of the ground after a long winter? But your landscape and garden can also inspire you. They can be a place of refuge from the rat race. All righty, let's take a few minutes now to answer our viewer email. We'd love to hear from you, perhaps you could share a picture or two with us as well. Just send us an email..
Our first question comes from a viewer who sent this in in late October and it's about collard greens. We're seeing more of these show up in stores and certainly at farmer's markets. Though a lot of us consider this sort of a southern dish. Her question is, what is this white powdery sort of stuff on the upper surfaces of the leaves. She said this was a volunteer plant that came up from a previous collard planting. she's seeing this return in her garden. Powdery mildew is totally different than downy mildew. This in terms of both the control and the damage that it actually does and the conditions that it needs. And powdery mildew really is going to show up with cool nights, a little drier air. Doesn't like to be overhead watered, particularly,and it is one of those things as well that you can control if you use a sulphur spray. You're gonna go ahead and wash that off before you eat them. You can also do a preventative if absolutely necessary, but the ideal preventative is to do good sanitation. The spores of the mildews are going to overwinter. The powdery mildew in particular in this case since that is what she has. So what you want to make sure you do is get rid of all the upper surface, make sure that your seeds are clean. When you're gonna till those collards in and under, all the debris must also be cleaned up around it. Ideally she would also rotate her crop. If she has downy mildew. We're talking about a completely different kind of situation that can actually kill the plants. So again, sanitation is really one of the best things you can do. Cleanliness, and make sure that you know which mildew you have to deal with. Our second question comes from Kearney. This is a viewer who has a red maple. The pictures came in late fall, and there is bark splitting all the way up the trunk. He first saw this last year, went up into the branches, and then of course had a thinner canopy in that tree as well. We had a lot of questions last year about thin bark trees, maples and pears in particular that were blasting their bark. In this particular instance his question is, is this tree a goner, should he go ahead and start over, what can he do about it? You look at the damage on this tree. You also look at the planting conditions which is a ring of stones and then some soil that has been added at the base of that tree. The trunk has been buried, so south, southwest facing, thin bark tree, red maple in Kearney.Probably not the best situation for that to begin with. I know people like the red fall color on the maples. Maple are a maple-linden maple-birch plant community. They like things that are a little bit colder, they like east and north facing, they don't like that wind and that winter desiccation. So our suggestion would really be let's go ahead and take that tree out. Rather than trying to give it a little bit of emergency care start over with something that would be a little bit more appropriate for the conditions. Our third question is fun, we don't know where this viewer sent this picture from. We did have a couple of these late season last year, and this one again came in late fall. His question is what in the world is this insect? It's very large, I think we had a couple of pictures of this again last season late. What this guy is is a wheel bug, so named for that wheel-like appendage on its back. If bugs have backs, it's actually one of the assassin bugs. Monstrous big, and it gets its name assassin bug because that's actually what it does. It's a beneficial insect. So what it does is it goes after and it pierces the bodies of pretty much soft-bodied insects, caterpillars, aphids, those kinds of things, paralyzes them, and then within 30 seconds has sort of consumed all of the good parts out of that poor soft creature. Now here's the deal. They're beneficial, they only have one generation during the season, and they look pretty much the same when they're little. Therefore they don't go through some sort of a strange metamorphosis where they're something different. So little guys get bigger and bigger and bigger and bigger. They are beneficial as I said, but their bite is dreadful, if you can call it a bite, it's actually a pierce, and it is, according to the people who have been bitten by an assassin bug, way worse than a wasp sting and it can last weeks to heal. So look at a distance, they're solitary and they're shy. Don't make it mad or it's going to attempt to assassinate your finger or something like that. Alright, our fourth question has to do with turf, and dry winter conditions and dry cold winter conditions in particular. The fact really is, there is a lot of foot traffic and some tire traffic, whether it is supposed to be that way or not through the turf, on the frozen turf. This is going to be damaging and what can be done about it? Our recommendation is stay off that turf if at all possible. We know that's not realistic in situations where you're out in the yard or it's a path from one point to another or it's school grounds or a park, but ideally at least don't walk in the same path or drive in the same path when that turf is frozen and when it does not have a cover of snow to help insulate the crowns. The issue with that, with stepping on it in frozen conditions, or driving on it, is those crowns will be pretty significantly damaged and then the recovery in the spring may take a lot longer, if it recovers at all. So again, cautionary note is stay on the paths that have been plowed as opposed to walking on that turf that has been frozen. For our final feature today we're going to help you with a common problem, tall ornamental grasses, asters and sedums can put on quite a show in the late fall, but they can also be susceptible to flopping. There are a few reasons for this issue and most of them are preventable. You know, we choose and place plants in our landscapes for their aesthetic qualities and we want them to behave certain ways. Therefore a lot of fuzz and a lot of flop is really appropriate, in other situations we want them to be a little bit better managed. We're gonna talk a little bit today about how to manage those plants that flop and discuss which ones tend to flop the most. I want to start with grasses, whether they are ornamental grasses or many of our natives, such as the little bluestem. This is a perfect example of one of the grasses that flops if a couple of different conditions exist. First off, knowing that this plant likes sun and likes it dry would suggest that its growth habit is going to be different if you put it in a situation where it gets a little bit too much shade and a little bit or a lot too much water. That causes the top growth to be heavy, the plant falls over, we no longer have it contributing to the landscape in the ways in which we wanted it. Same thing will happen with our switch grasses,our native lovegrass, and even to a lesser extent some of our other ornamental grasses. We don't typically expect balloon flowers to be one of those plants that flops, but again, given conditions that might include too much water during a certain season and damage to the crowns, in this case probably vole damage, what happens is the base of that plant becomes weakened, the top is really really heavy, and the plant begins to fall over. Asters and sneezeweed or Helen's Flower are other examples of plants that may have such topheavy growth when they're in flower, especially if they have an unbranched stem, that unless you manage them properly, they may flop during the season and open up in the center as well. Plants that have been in place too long may actually exhaust their environment and they flop along the edges because the center is completely died out. Siberian iris is one example, sedums will do the same thing. So what exactly do we do about these plants that want to flop or lodge, whether it is genetics, environmental, or age? We have some options available to us, the first of those is to look at the environment and make sure that you have selected a plant for its growing conditions, or modify those conditions. Stop watering if it's a plant that really doesn't want water. If the landscape has changed over time and you have too much shade for plants that are going to flop in shade, move the plants, prune the tree if you need to do that. If the plant is old, go ahead and divide, dig and divide at the proper time, making sure that you take good pieces of the old plant, again, put those into the right environment. You can also pinch or cut back by a third for certain plants. Sedum is one of those that if you cut it back by about a third during the early part of the summer, it will actually stay shorter, bloom a little bit closer down into the crown of the plant and won't get those topheavy floppy stems. One of the main things to understand however is there are certain perennials that if you do cut them back like that they're not going to branch and bloom. And of course the other option is to go ahead and cage. And the beauty of caging, if you do it early in the season, and again, if those environmental conditions are correct, is that the cage sits, the plant grows through it, everything really looks the way you want it to look, and you haven't had to deal with cutting or moving those plants. Garden chores like this might not be a whole lot of fun but they really can mean the difference between healthier vibrant plants during the growing season or plants that die out altogether. Try to understand what those plants need, where they're growing, and whether they're going to need help standing tall in the cold.